Archive photographs of the National Shell Factory, Parkgate Street. | Come Here To Me! Archive photographs of the National Shell Factory, Parkgate Street. 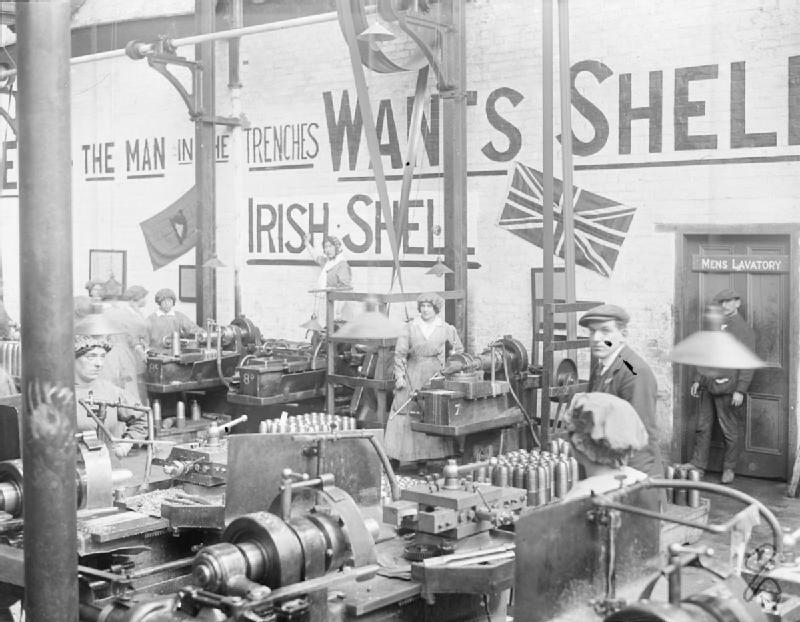 By 1917 National Shell Factories were established in Cork, Dublin, Galway and Waterford…The workforce in the new shell factories was overwhelmingly female. Only five per cent of this industrial workforce could be male under government munitions regulations. 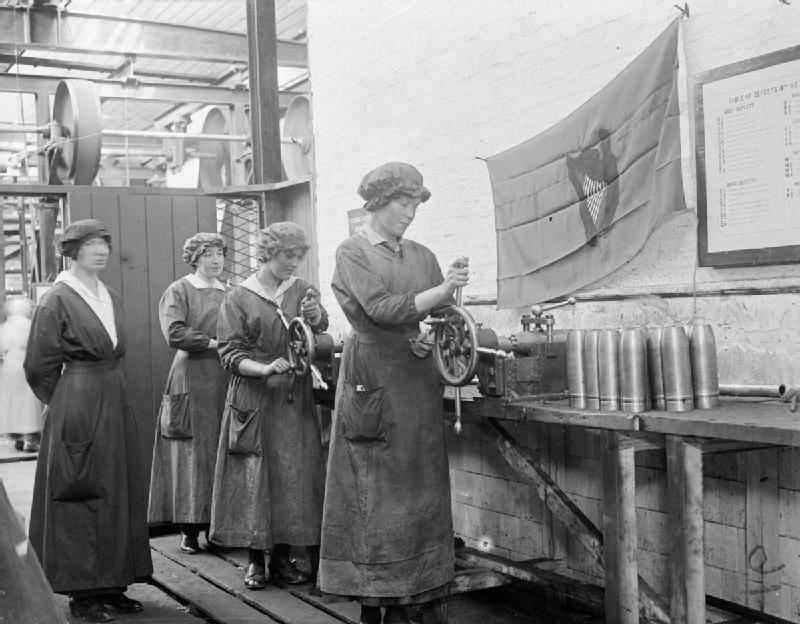 The Shell Factory also gave many young Irish women their first experience as trade unionists, with the women represented by the NFWW, the National Federation of Women Workers. There was labour agitation within the factory on occasion, with the union succeeding in bringing about improved conditions and rates of pay, but not without struggle. In September 1918 for example, almost 600 women were temporarily locked out of employment. It is noted in Our War: Ireland and the Great War, that the factory “had a nurse on full-time duty and a canteen staffed around the clock by lady volunteers”. 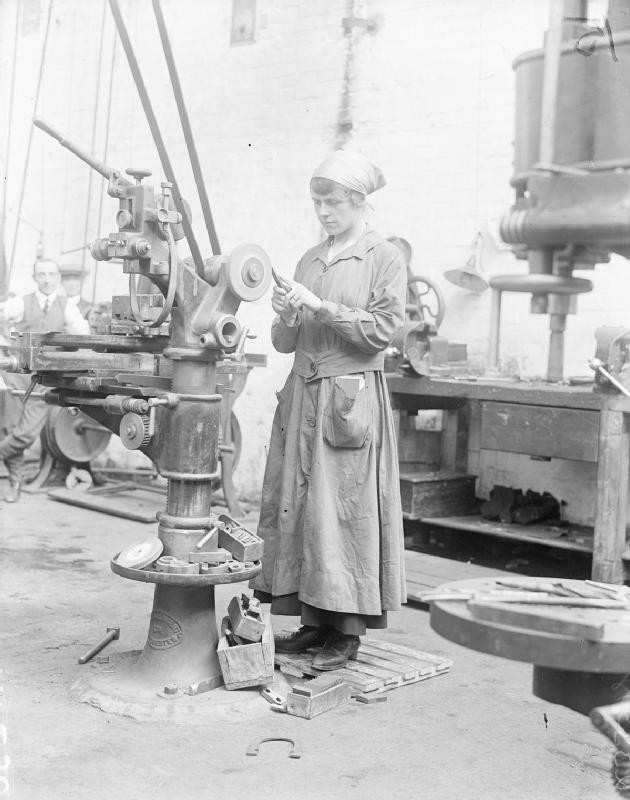 Women can be seen at work in the series of photographs digitised by the Imperial War Museum in London. 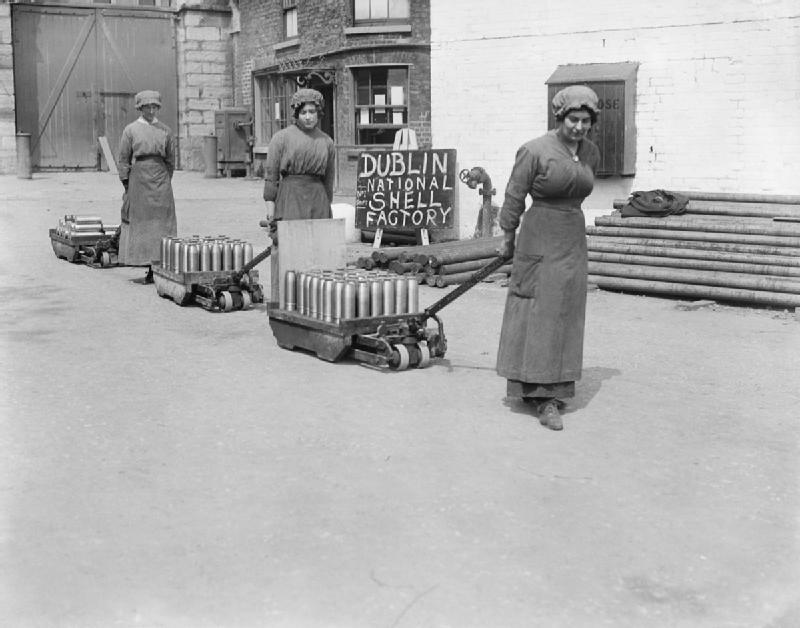 Notice the presence of the Irish Harp and the Union flag on the walls of the premises, and the painted slogan encouraging the women to work as the men at war required shells urgently. One of the women is listed as ‘Kathleen Nolan’. There are various shots of Nolan at work, for example “Kathleen Nolan presses a driving band onto a shell” and “Kathleen Nolan sharpens a tool on a grindstone”. 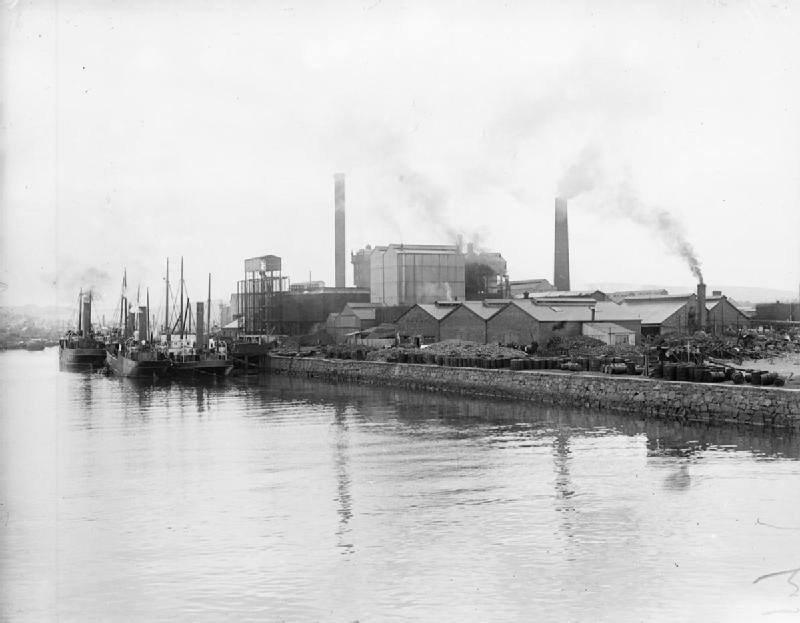 What became of the Shell Factory following the end of the war? It is noted in The Dublin Fire Brigade: A History that not long after the burning of the Custom House in 1921 there was a fire at the site, which caused serious damage to the premises. by that stage, it was “housing motor cars and army lorries under repair”, making it a target for Irish republicans. These images come from the online archive of the Imperial War Museum, available to view and search here. Interesting reading and photographs. I’ve heard a little about this factory. I think after the war, many of the women who had worked there suffered from poor health for the remainder of their lives, due to the chemical substance they handled during the manufacturing of the shells. They had some sort nickname referring to their skin, the side effects of the chemicals having made their skin turn a pale yellow colour. Poor women,working for their family by helping destroying other familys. Why so much war and evil !It´s an retoric question,I suppose. These are the victims of the First world war that you do not hear about. Ciarán, you’re right – they were known as ‘Canaries’ because the cordite made their skin turn a yellowish colour.